Where would you place Britain on the scale of tolerant nations? Probably right up there if you weren't one of those who have suffered from her intolerance. Possibly you agree with an article in The Spectator last year where the writer said, "Brits are, I firmly believe, the most tolerant people on earth". If you believe that, then this is where you and I part company. We must open our eyes to what is going on around us every day. To not admit to failings within the nation leaves the bigots and the haters unopposed, and flag waving, orchestral jingoism will help to paper over the rotten cracks within. Do you remember the 2010 FIFA World Cup when Germany beat England, and England 'fans' burned a German flag in Leicester Square, and trashed a Haagan Daz restaurant? Why did they do this? Please god, don't just say it was the drink. A young man out with his girlfriend was attacked by three men, and stabbed. The reason? The young man had ginger hair. A family of four have just been driven out of their home for the third time. The reason? All four have ginger hair. I remember the times when I was in work that a street homeless man would come into the Centre covered in blood after receiving a good kicking while he was trying to get some sleep. Or an ex-offender who was trying to turn his life around, being hounded from the street because of fear that he would commit crime. Similar attitudes were displayed towards those with mental health problems, where the ignorant morons saw such individuals as those who would murder them in their beds. It was because of examples of daily intolerance that about 16 or 17 years ago I drew up a Statement of Core Values for the Charity. Two points in particular informed the work that we did. "We will respect the uniqueness of the individual". "We are committed to challenging oppression and inequality, and will positively promote its core value in all areas of its work and structure". 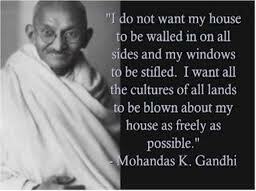 The words respect, and challenge oppression and inequality make me particularly sensitive to any acts of intolerance. Let's not hide from these matters, or there never will be any change in the future. Britain is good at being politically correct, and at demonising anyone who refuses to be similarly so. Roland Hulme calls this "a rather repressive form of social fascism", and must not be confused with tolerance. PC is social conditioning and behavioural policing, enforced by the threat of polite society ostracizing you. Roland's point is worth noting, "If you want a demonstration of Britain's true character, just take away that expectation of political correctness and you'll see quite how mean-spirited and vicious we can be". By the way, this Blog is not an attack on the nation. It is however an attack on those intolerant morons who make life a misery for others. Let me draw your attention to what has become known in the last few years as Hate Crime. I have been reading the third annual report from the Crown Prosecution Service (CPS), called CPS Hate Crime Report 2009-2010. Defining Hate Crime, and recording Hate Crime is still far from an exact science. It is also acknowledged that such crimes are under reported for a variety of reasons. The CPS report covers three areas of hate crime, plus statistics where crimes against an older person have been identified. The report breaks down the statistics into the 42 police areas in England and Wales, and gives numbers for convictions and those that were unsuccessful. Look at the total overall, and the three areas above. As horrific as 14,000 reported hate crimes is, under-reporting is masking the extent of the problem. Take homophobia for instance. Stonewall, the gay rights charity say that surveys have found that one in five (20%) gay people had been the victim of a hate crime in the last three years. The Metropolitan Police say in their latest reports that just over 1000 incidents of homophobic hate crime were reported. London has an estimated gay and lesbian population of 750,000, so according to the Stonewall survey, the incidents should be nearer 150,000 over three years, rather than 1000 over one year. Stonewall's report on homophobic bullying in schools (The Teachers' Report) has been called deeply alarming. Nine in ten secondary school teachers, and two in five primary school teachers said pupils experience homophobic bullying, even if they are not gay. Racist and religious hate crime as well as Disability hate crime can similarly be shown to be under reported for a raft of reasons. 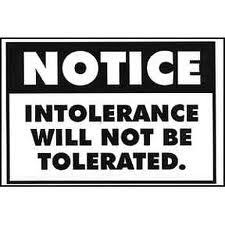 So, in my view, intolerance abounds. Opponents will say, but it's only a small minority of people who are intolerant, the majority are OK. 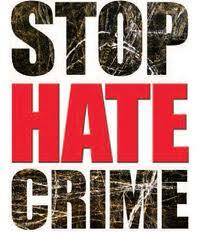 It may be true that it's a minority that are engaged in hate crime, but that minority is not small. Intolerance is wider and greater than examples of hate crime, but where does intolerance come from? This is such a complex subject, because we are complex beings. Is it just the battleground between good and evil? I believe in goodness, so I have to believe in evil. Most of us are not one or the other, but both. As someone once said, "We are beautiful and ugly, soothing and terrifying, brutal and caring, we love and we despise". But, as Charles Weinblatt, author of 'Jacob's Courage: A Holocaust Love Story' asks, "What brings a person to despise a stranger? Why do some people hate and fear those who are different? 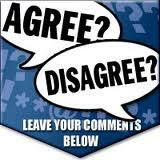 Why do so many people find it easier to hate than to tolerate?" These are mighty questions, to which there are no easy answers. It cannot simply be nature or nurture, for there are exceptions to both. So why is there so much intolerance around us, and what can we do to make a difference? Weinblatt examines the holocaust, and asks why did so many people go along with this horrific plan, and how could so many turn their backs to the immorality of mass extermination. He says, using words that are relevant today, "I believe that people find it easier to hate because tolerance requires effort. Haters live with haters in a community of malevolence. The more they hate, the more they are approved by their social group. ... Fear may be at the heart of racism and bigotry. We fear that which we do not understand. We fear anyone who might be perceived as better than we are. We therefore use the tools of bigotry to become superior to others. Our fear drives us to prove that we are better than the 'others' are. It feels good to be superior. Yet, in order for one person to feel superior, another must be subjugated. In order to feel better, we must dominate someone. The easiest way to dominate is to hate those who are not a threat. And it feels good to make them live in fear". I want to believe in the possibility of change; that the bonds of bigotry can be broken one person at a time, with education, conversation and engagement. I want so much to believe in that. Weinblatt concludes, "Racism, hatred, intolerance and bigotry are the artifacts of fear. Eliminate fear and there will no longer be a need to use the tools of bigotry. This is our challenge. We must convince the haters that they have no reason to fear". Another Core Value from my previous charity was this, "We believe that warmth and support from one being to another can achieve positive change". The reward for success is tolerance, respect and mutual recognition. What positive thoughts do you have on this subject? Thank you John - thought provoking, pertinent and true. It makes my latest blog about the footballer Tom Finney seem a little trite but in a way there are similar messages. In the final analysis violence, intolerance, aggression etc. are not about one person or even a particular group they are about the values of the whole society and we are all part of that society - if we as a society tolerate the sort of incidents you write about or that people like Wayne Rooney perpetuate then we give them credibility and legitimise them. It is important that people speak out and say 'enough is enough'.